The leader of the UK's biggest public sector union has said its members will "never forgive" Labour if it fails to back them in their fight over pensions. 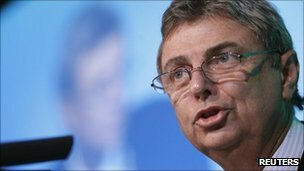 Dave Prentis, general secretary of Unison, told Labour's conference that workers expected leader Ed Miliband to support them if they decide to strike. Earlier, shadow Welsh secretary Peter Hain said Labour was proud of its union ties and wanted to strengthen them. But Mr Miliband has so far chosen to not to back industrial action. The government's pension proposals will see public sector staff paying more and working longer for lower payouts in retirement. The TUC has called a day of action on 30 November over the plans, pledging the biggest day of union mobilisation in a generation. Ministers have criticised unions for staging walk-outs when negotiations are still ongoing and argue that changes to pensions are vital to make them more affordable at a time when life expectancy is rising. 'Shoulder to shoulder' Mr Prentis, whose union represents 1.3 million people working for the NHS, local authorities, colleges and the police, issued a defiant message to the Labour leadership during the annual gathering in Liverpool. To loud cheers from Labour delegates, he said his union would "expect the support of this party and its leader" if members chose to take part in the 30 November action. "They look to Labour to stand shoulder to shoulder with them," he said. "They will never forgive us if we let them down and neither will their union." Mr Prentis said his members were not "militants" but they could not sit by while their livelihoods were under threat, adding: "Sometimes you have to remind people what you are worth." Earlier, at a fringe meeting organised by teaching union the NASUWT, Mr Hain insisted: "I am proud of our trade union links, as is Ed - indeed we want to strengthen them. "Our problem is not that we have the trade union link, it's that it has ceased to be as dynamic and alive as it once was." He added: "I don't apologise for our trade union links and I don't understand or really in any sense recognise the caricature of the relationship with the party that is often portrayed in the media that it's about being dictated to by trade union representatives." Mr Miliband was heckled at the TUC conference earlier this month over his refusal to endorse strike action. He told delegates he understood their anger but insisted it was a "mistake" to strike while talks are going on. Union leaders say the discussions are not meaningful.